Coffee and chocolate are definitely a no brainer! I mean, just think about Caffé Mochas! The rich, slightly acidic coffee plays well with the sweet hit of cocoa and sugar. 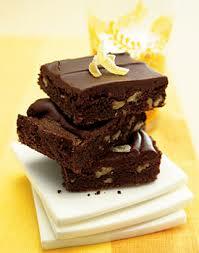 For brownies, a full-bodied coffee from Indonesia or Guatemala would pair beautifully with dark chocolate brownies. These brownies call on cocoa, walnuts and ginger, used as a garnish to compliment a full flavoured Guatemalan coffee bean, like an Antigua Coffee would work great! This recipe will make 15 brownies. Preheat oven to 350°F. Spray 13x9x2-inch metal pan with nonstick spray. Combine sugar, butter, cocoa, ground coffee, and salt in large metal bowl. Place bowl over saucepan of simmering water and whisk until butter melts and ingredients are blended (texture will be grainy). Remove bowl from over water; cool mixture to lukewarm if necessary. Whisk in eggs and vanilla. Sift flour over and fold in. Mix in walnuts. Spread batter in prepared pan. Bake brownies until tester inserted into centre comes out clean, about 25 minutes. Cool brownies in pan.